Inventories act as the balancing point between supply and demand. During periods when production exceeds consumption, crude oil and petroleum products can be stored for expected future use. 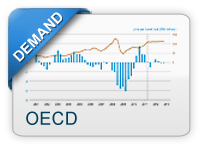 In the economic downturn of late 2008 and early 2009, for example, the unexpected drop in world demand led to record crude oil inventories in the United States and other OECD countries. In contrast, when consumption outstrips current production, supplies can be supplemented by draws on inventories to satisfy the needs of consumers. 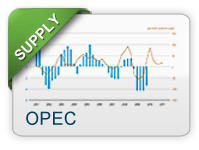 Given the uncertainty of supply and demand, petroleum inventories are often seen as a precautionary measure. In this chart, the price of the next (prompt) month's oil futures contract is subtracted from the price of the oil futures contract 12 months ahead. The change in this spread is then plotted over time. This difference is compared to the change in OECD petroleum inventories. The more positive the spread between the near term and longer term contracts, the greater the incentive to build inventories. Also, declining inventories tend to go hand-in-hand with increases in near term prices relative to prices further into the future. Refineries and storage terminals can store crude oil and/or finished products like motor gasoline, heating oil, and diesel to prepare for seasonal fluctuations, refinery maintenance, or unexpected weather. Some petroleum products, such as heating oil and gasoline, have pronounced seasonal demand variance; inventories rise when consumption is lower and are drawn down when consumption increases. For this reason, inventory levels are most usefully assessed in relation to prior year levels for the same calendar quarter. Because inventories can satisfy either current or future demand, their level is sensitive to the relationship between the current price of oil and expectations of future prices. If market expectations indicate a change toward relatively stronger future demand or lower future supply, prices for futures contracts will tend to increase, encouraging inventory builds to satisfy the otherwise tightening future balance. On the other hand, a sharp loss of current production or unexpected increase in current consumption will tend to push up spot prices relative to futures prices and encourage inventory draw downs to meet the current demand. The relationship between prices and inventories allows for effects in either direction. If futures prices rise relative to the current spot level, incentives to store oil (and wait to sell at the higher expected price) will strengthen. Conversely, if market participants notice an increase in crude oil storage, this increase can indicate that current production surpasses current consumption at the prevailing price. 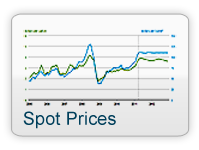 Spot prices will likely drop to rebalance demand and supply. 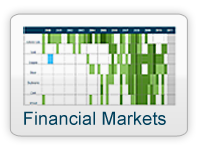 This balancing between current and future prices and between supply and demand through inventories is one of the main connections between financial market participants and commercial companies with a physical interest in oil, both of whom engage in futures trading. Physical inventory levels and price spreads over time act as a signals between current market participants and those with longer-term exposures. 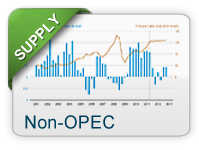 The U.S. Energy Information Administration publishes weekly, monthly, and annual inventory statistics for crude oil and its related products. 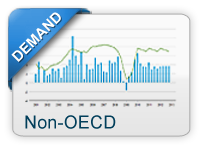 Industrialized countries that belong to the Organization of Economic Cooperation and Development (OECD) countries usually publish inventory statistics on a regular basis. However, inventory data for other countries—including key developing countries with rapidly growing oil consumption as well as major producing countries—is sometimes available on a less timely basis, or in some cases, not available at all. In addition, oil is often stored on ships at sea. The lack of complete information on inventories creates additional uncertainty in oil markets, which can also influence oil prices. Finally, in addition to the commercial inventories discussed above, the United States and other countries maintain strategic reserves of oil. The U.S. Strategic Petroleum Reserve, which is maintained by the Department of Energy, currently holds almost 700 million barrels of oil that can be drawn upon by order of the President in the event of a supply disruption that meets specific statutory criteria. Members of the International Energy Agency, including the United States, collectively hold about 1.6 billion barrels of publically-owned petroleum stocks for emergency response.